Still haven’t gotten the latest iPad or iPad mini you’ve always wanted? 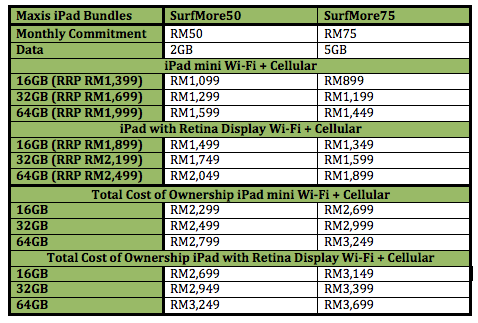 Maxis has finally updated its iPad bundle, offering the iPad mini from as low as RM899, and the latest iPad from RM1,349. We previously shared that Maxis was only offering both devices at KLCC Maxis center. The plans were specifically catered for iPad with an internet quota of a whopping 12GB. This time round, Maxis is offering both devices with its latest internet plans – SurfMore 50 and SurfMore75 with a 24 months contract.